> so today was a bit rough. somehow things didn’t fit together the way i intended, and so i left lab sort of in a funk. however, i got to witness the super-exclusive vito acconci talk and presentation at cavs this evening. i left early, though i saw some cool projects such as ‘instant house’ and the upside-down glass house. acconci studio investigates the fascinating relationship between humans and their spaces. on my way home, totally out of routine, i ducked into the gap in central square. i usually don’t stop inside, though i was curious on what treasures might hang on the sale racks. optimistic, i know. above, i’m illustrating once again why things with scratchy fibres don’t sell. check this out… acrylic, nylon, and mohair. ever-so-slightly better than H&M’s hive-inducing acrylic-mohair blend, but i still bristle at the scratchy lace. i would totally wear it if my skin didn’t wish to crawl continously underneath that swaddling of thistly threads. other than the fact that you itch yourself into a writhing pink ball of flesh, it’s pretty classy. i also noticed a proponderance of cables. they always come back every year, somehow in a different combination or permutation or width or weight or right-cross or left-cross… classic brands leave no cable pattern unturned! on the left is a sweater from the gap store, with its pattern of wide-skinny cable repeats. on the right is from a promotion at j.crew that landed in my email box today, announcing the wellesley cabled sweaters knit in their ‘exclusive’ yarn. so basically they bought out the entire mill lot. that’s understandable; and i have to admire (at the cost of $68) their blend of merino, viscose, angora, and cashmere. taking a closer notice at the wellesley cable, it seems to be a medium-cable and rib pattern. this got me thinking on the way home… how did cables become the de rigeur pattern for classic, preppy brands? why have cables developed into something that signals the cape cod/hamptons/i-wear-argyle-underwear aura? and so, a little online research commences. to the left are some cable offerings from american eagle and anthropologie respectively. looks like we have an elongated-cable and rib pattern, and a chunky bold cable motif. so, i suppose my question still isn’t answered. why cables? is it the historical link wayyyy back to the british isles and their classy tweedy ways? are we mentally making the connection from prep-schooling to yacht-owning to irish fishing? if anyone has some tidbits, i would love to hear about it. whew. now where does that leave me? tonight i worked a bit more on the bark rib. check it out, gracefully covering up my coy little pillowform. 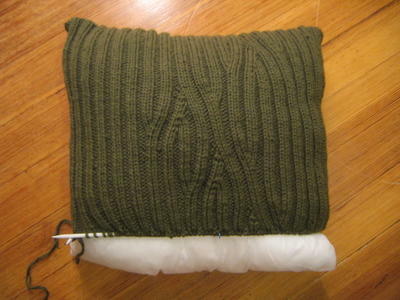 luckily, i think i may not need to do as many pattern repeats as i expected, since the pillow is squishy and the yarn quite accomodating to stretch. about 20 more rows to go, and then sewing the whole thing up. i miscalculated my pace before, and i clocked myself at 8 rows per hour. so i have a on-the-horizon three hours left (including the seaming) before ms. ribbing gets to plunk down on a soft bed where she belongs! i hadn’t planned for anything additional, but any suggestions for tassels, ribbons, edgings, buttons, or beads? a FO is in sight! w00t! >In spite of my inclination to dive into a cable-related research project, I must resist. You are a crack-monkey and I won’t get hooked. That said, you’ve seen the museum of knitwear stuff in England, right? I want to say its called Victoria something. Sorry to say I can’t remember. But I’m sure you can google it into submission. Additionally, there are tons of resources about cable history, the aran islands (ire) and other knitwear patterns. I have a traditional knit stitches book that you can borrow too. But I’m not sure there’s an explanation for how those traditional patterns became preppy chic.Keep me posted. I am very intrigued. Crack.